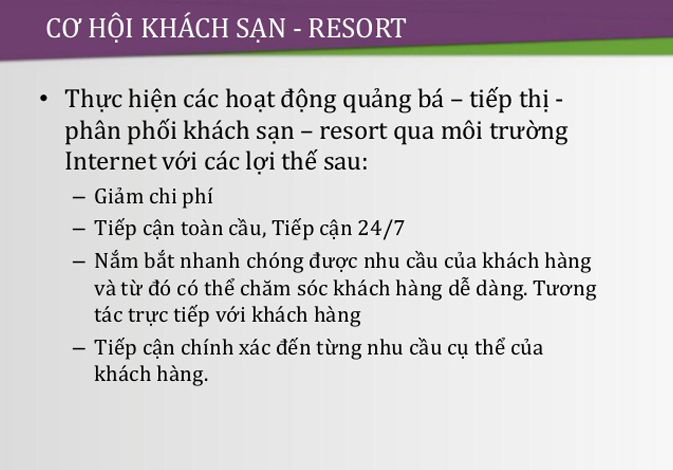 * Giải pháp đột phá trong kinh doanh nghành Hotels / Resorts? - Nếu Quý Vị đang mong đợi doanh thu đi lên một nấc thang mới. Chúng tôi sẵn sàng hợp tác và chỉ cho Quý Vị cách làm thế nào? Sau khi làm việc với chúng tôi, một số Hotels - Resorts đã tăng trưởng doanh thu, công suất phòng và lợi nhuận với mức tối đa. - Chúng tôi đã có hơn 20 năm kinh nghiệm và có văn phòng tại TP.HCM. 1.1/ Distinguish marketing from sales and describe the marketing mix. 1.2/ Explain management's role in marketing and sales. 1.3/ Summarize the importance of marketing and sales to hospitality companies, and describe the challenge of hospitality marketing and sales. 1.4/ Identify trends that affect marketing and sales in the hospitality. 2.1/ Identify the benefits of developing long-range marketing plans and describe the make up and function of marketing team. 2.2/ Describe the first two key steps of marketing plan: conducting marketing audit, and selecting profitable target markets. 2.3/ Describe the last three key steps of a marketing plan: positioning the property, establishing objectives and actions plan, and monitoring and evaluating the marketing plan. 3.1/ Summarize the criteria business travelers use to make lodging decisions, identify types of frequent business travelers, and describe the women business travelers segment. 3.2/ Explain how hospitality properties are meeting the special needs of business travelers. 3.3/ Describe how hospitality properties are reaching business travelers. 4.1/ Describe how hospitality firms market to families, seniors, baby boomers, GenXers, and other individual leisure travelers. 4.2/ Describe how hospitality firms market to group leisure travelers and the intermediaries who aid these travelers. 4.3/ Explain how small hospitality firms can market to leisure travelers, and explain the concept of vacation ownership. 5.1/ Describe travel agencies and the kinds of travelers they serve. 5.2/ Explain how travel agents get information about the properties and book reservations and explain how hospitality firms serve travel agents and their clients. 5.3/ Describe ways in which hospitality salespeople find and reach travel agencies, and summarize issues facing travel agents in the future. 6.1/ Describe types of association meetings, list possible decision-makers for association meetings, and outline factors association meeting planners consider when planning meetings. 6.2/ Describe type of corporation meetings, list possible decision makers for corporate meeting, and outline factors corpotate meeting planners consider when planning meetings. 6.3/ Identify ways hospitality salespeople can find meetings business and reach meeting planners. 7.1/ Outline considerations for marketing hospitality products and services to international travelers. 7.2/ Summarize considerations for marketing hospitality products and services to honeymooners and sports teams. 7.3/ Outline considerations for marketing hospitality products and services to government travelers, travelers with disabilities and travelers from other special segments. 8.1/ Identify the duties and responsibilities of positions typically found in a hotel marketing and sales office. 8.2/ Describe how a sales office is organized, identify characteristics of successful salespeople that managers should be aware of when building an effective sales team and describe techniques managers use to recruit, hire, train, manage and evaluate salespeople. 8.3/ Explain how salespeople are compensated and describe supplemental sales staff. 8.4/ List and describe typical sales meetings, and identify the types and uses of records and forms, file systems, and reports used in the marketing and sales office. 8.5/ Describe how automation is used in a marketing and sales office, and summarize how the efficiency of the office can be evaluated. 9.1/ Discuss the sales dimension of the reservation process, outline the different types of reservation, and describe reservation inquiries and their distribution channels. 9.2/ Describe the process of taking group reservations and discuss group reservation issues. 9.3/ Identify the tools managers use to track and control reservations availability, and discuss reservation record. 9.4/ Describe policies and procedures surrounding the confirmation, modification and cancellation of different types of reservations. 9.5/ Explain the function of typical reservation reports, and summarize other reservation considerations. 10.1/ Explain the concept of revenue management, and discuss how managers can maximize revenue by using forecast information in capacity management. Discount allocation, and duration control. 10.2 / Discuss common formulas managers use to measure and manage revenue. 10.3/ Explain how revenue management decisions are affected by group room sales, transient room sales, other revenue opportunites, local and area – wide activities, special events and fair market / share forecasting. 10.4/ Discuss the revenue manager's role and position, summarize typical revenue meetings, outline potential tactics to use in period of high and low demand, discuss revenue management tactics, and explain how revenue management software helps managers. 11.1/ Describe the objectives of various types of personal sales calls. 11.2/ Identify sources for prospecting individual and group business and explain how salespeople qualify prospects as potential clients. 11.3/ Describe how salespeople can prepare for presentation sales calls and project a professional image when making presentations. 11.4/ Summarize the five steps of a presentation sales calls. 11.5/ Explain how salespeople can improve their productivity through efficient time management and key account management. 12.1/ Describe the basis of effective telephone communication in relation to hospitality marketing and sales. 12.2/ Identify various types of outgoing telephone calls related to marketing and sales function. 12.3/ Describe the steps involved in making a telephone appointment call, and describe sales calls, promotional calls, service calls and public relation calls. 12.4/ Identify various types of incoming telephone calls related to the marketing and sales function, and describe how hotel handle them. 12.5/ Describe telephone sales blitzes and telemarketing operations. 13.1/ Describe internal marketing and employee empowerment. 13.2/ Define "internal sales" and describe the general manager's role in internal sales. 13.3/ Summarize the role of employees in internal sales and discuss relationship selling, employee training, how employees can apply sales skills and employee sales incentive programs. 13.4/ Explain how internal merchandising works in guest - contact and back-of-the-house areas. 13.5/ Describe how special services and in-house promotions can be used for internal marketing and sales efforts. 14.1/ Identify the duties and responsibilities of positions typically found in a hotel catering department, and describe the department's marketing plan development. 14.2/ Describe catering promotions and summarize how salespeople develop leads and follow up inquiries in building business for the catering department. 14.3/ Describe sales strategies and procedures for selling to catering clients, explain how catering functions are planned and managed, and identify ways the catering department can follow up accounts. 14.4/ Explain how food and beverage functions other than banquets can increase catering department revenues. 14.5/ Summarize issues involved in meeting room sales, including types of meeting rooms, meeting rooms set ups, how meeting rooms are booked, and how meeting rooms are managed. - Chiến lược dự báo về doanh thu bán hàng, chiến lược bán hàng, khuyến mãi, định giá. - Chiến lược Marketing (xác định lợi thế cạnh tranh, chiến lược phân phối, chiến lược tiếp thị, định vị sản phẩm thương hiệu). - Phân tích tài chính (chi phí đầu tư hợp lý, bảng phân tích lãi lỗ, phân tích điểm hoà vốn, dòng tiền, bảng cân đối kế toán) dựa trên số liệu đầu vào. - Xuất file kế hoạch qua Word, Powerpoint, Excel, Web để phục vụ việc thuyết trình hay báo cáo dự án kinh doanh. - Phần mềm quản lý các kênh bán hàng online (OTA). 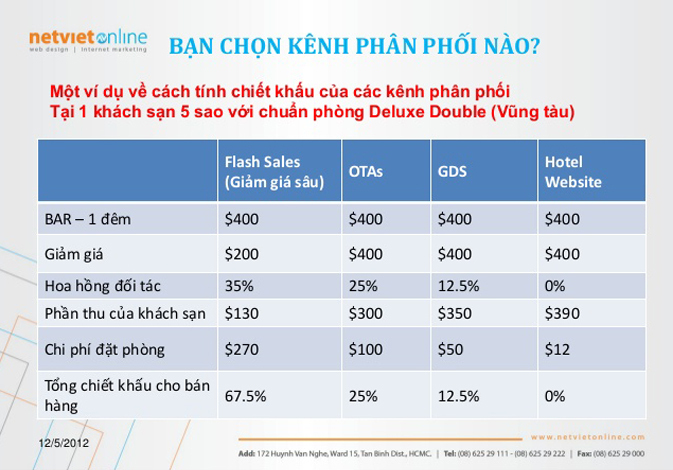 - Phần mền quản lý booking engine cho website của khách sạn. - Giải pháp đột phá trong kinh doanh nghành khách sạn.